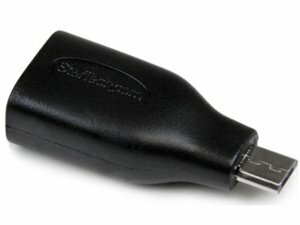 Connect your USB On-the-Go capable tablet computer or Smartphone to USB 2.0 devices (thumb drives, USB mouse or keyboard, etc.). The UUSBOTGADAP USB OTG Adapter converts your Micro USB On-The-Go capable tablet computer or Smartphone into a USB OTG host by adding a USB port to your mobile digital device, which increases its functionality and enables you to use a USB peripheral such as a thumb drive, or a USB mouse or keyboard, etc.This Micro USB OTG Adapter is constructed for maximum durability, to ensure dependable, long-lasting connections.This adapter will only work with devices that support USB OTG. Please consult your documentation and/or your service provider to ensure that your device does support USB OTG functionality.